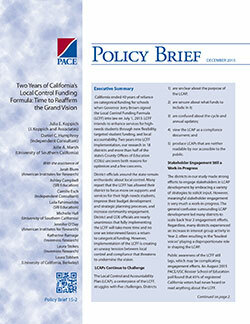 This article seeks to deepen our understanding of the nature and quality of democratic participation in educational reform by examining the first-year implementation of California’s Local Control Funding Formula (LCFF) mandating civic engagement in district decision-making. Drawing on democratic theory, empirical literature, and data from 10 districts, we find that even when district leaders committed to involving stakeholders in decision-making, achieving this vision was often constrained by power imbalances, deeply engrained institutional habits, and limited capacity. This report seeks to help policymakers and others better understand ways in which LCFF implementation is changing fundamental aspects of resource allocation and governance in California’s K-12 education system. The LCFF provides all districts with base funding plus supplemental and concentration grants for low-income students, English learners, and foster youth. California has taken the first steps down an historic path that fundamentally alters how its public schools are financed, education decisions are made, and traditionally underserved students’ needs are met. The Local Control Funding Formula (LCFF), passed with bipartisan legislative support and signed into law by Governor Jerry Brown on July 1, 2013, represents the most comprehensive transformation of California’s school funding system in 40 years. The LCFF significantly loosens the reins of state control over education.